This Medieval Saxon Nasal Helm with Aventail is made from 18-gauge steel and displays an authentic look. Nasal helms are simple in design, but helmets like this one enjoyed great success throughout early medieval Europe for a time. This helmet offers superb protection for the head and some of the face while retaining good visibility for the wearer. A nasal bar runs down the center to offer facial protection and is secured with rivets. 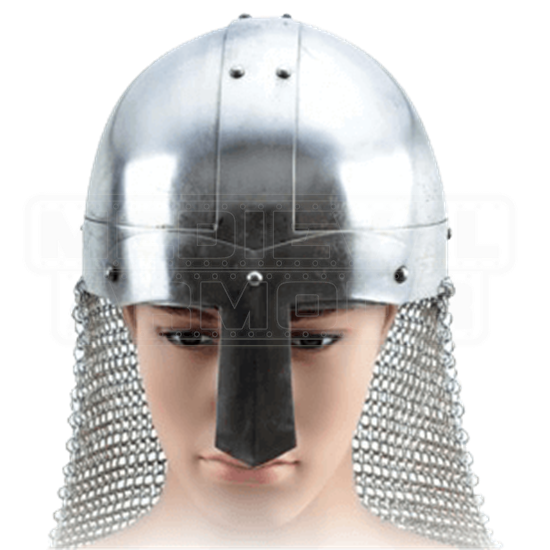 A chainmail aventail is attached to the back to provide extra protection for the head and neck. 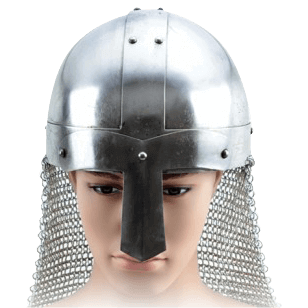 This helmet makes a great addition to any collection, and it is perfect for reenactments or LARP events.